Simply finishing the World’s Toughest Mudder is a feat of physical and mental ferocity. It’s a contest for athletes “who find marathons too easy and triathlons meh,” merging extreme endurance with severe military-style obstacle courses. Ryan Atkins of Toronto won the World’s Toughest Mudder in 2013. He followed up by being the only competitor to race in all four obstacle world championships in 2014; he medaled in three, and won the Toughest Mudder for a second consecutive year, in the process racing 95 miles over 24 hours in the Nevada desert, all while wearing a wetsuit. In a Q&A with The Huffington Post, Atkins shared details about how he eats, how he trains, and how he sleeps, his favorite travel journeys, his most useful advice, and even how he proposed to his girlfriend. You celebrated the new year by climbing Mount Washington in horrendous weather. What was that like? What are you telling yourself when you’re approaching those big challenges? There is so much going on in your head when you’re climbing a mountain in really cold, terrible, whiteout conditions. You’re always assessing risk and reward, thinking about avalanches, getting lost in the whiteout, making sure you don’t do anything stupid. It’s definitely a struggle, and my mantra is: one step after the other. There are points where you’re going up, you’ve been out for several hours, and you can’t see the top. But you just keep plodding along and believing that you’re going to get there. Keep going, next step, next step. That’s pretty core to my beliefs, and it seems to be working pretty well [laughs]. Sometimes you can’t look at the challenge as a whole, the path is too daunting. But if you just think about not stopping, about keeping going the best you can, then eventually you get there. Once you reach the top, it’s an awesome feeling. You’ve competed in a bunch of bizarre competitions and obstacles. What’s is the strangest challenge you’ve faced? Probably racing in World’s Toughest Mudder. The first year was the strangest because there were so many aspects of it that were outside of my experience and my comfort zone, namely running for extended periods in a wetsuit, 100-plus kilometers, something I had never even dreamed of doing. That poses all sorts of challenges, like going to the washroom at 3 a.m. [laughs], doing all sorts of tasks. You had to change up your running gait because the wetsuits are so restrictive. Even just breathing. You can’t go as hard because breathing’s such an issue. It feels like you’re being suffocated the entire time. Your competitions have taken you to some extreme locations. Is there a memorable travel journey that you’d recommend to others? 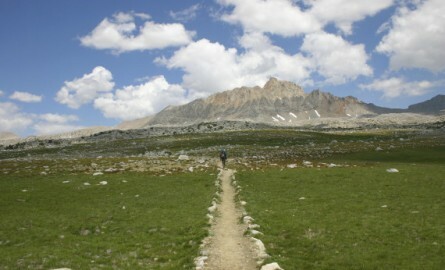 One of my coolest traveling experiences was running the High Sierra Trail in California. That was awesome, probably the greatest trail I’ve ever experienced. It starts at Sequoia National Park and finishes on top of Mount Whitney in California, and it’s just a totally gorgeous trail. That one stands out. What’s most important with travel is being willing to explore wherever you are. I find amazing things right around my backyard all the time. I’ve been in hotels in crummy areas, and then you just go for a run and you find really cool waterways and bike paths and trails, interesting things that aren’t on any map or any travel guide. It’s just a matter of always being willing to go out and explore. Just because you’re in an area that isn’t famous for one thing or another doesn’t mean it doesn’t have something incredible to offer. Honestly, it’s probably a park not too far from where I live. Killarney Provincial Park, about five or six hours north of Toronto. It’s just beautiful Canadian forest, with crystal-clear lakes and white quartzite rock all over. It’s just a gorgeous place. There’s hiking and canoeing. It’s probably pretty remote for most people, but I think that’s one of the most beautiful places I’ve been. Every morning, pretty religiously, I eat the same breakfast, which is four eggs, toast, butter, and ketchup. [Laughs] Every morning I come downstairs and make the exact same thing. If I’m racing to get out, I’ll have oatmeal. I love cooking, and I love eating healthy, but I think people can take their diet way too seriously. As long as you’re using common sense and eating good food, you can’t go too wrong. Do you have any unique hobbies or ways that you spend your downtime? I do something called slacklining. You set up a piece of nylon webbing between two trees that has a lot of bounce to it, then you walk on it and do tricks on it. It’s not like a tightrope. It stretches a lot more than a tightrope, and it’s flat, about an inch wide. I unicycle, which is also a lot of fun, and I play the didgeridoo, an Australian instrument. I find it relaxing. Have you changed your mind about anything substantial in the course of your life? If you want it bad enough, you can probably go get it — within reason obviously [laughs]. Everyone can’t be an astronaut. But everyone can have a job that they love. The world would be a lot more fun and people would be a lot happier if that was the case. Are there books that have had a significant impact on your life or your athletics career? I read a book called “The Boys in the Boat” not too long ago, a book about rowing. I really enjoyed that. I typically read a lot of non-fiction. I also recently read “The Sports Gene,” which I really enjoyed. Maybe not life-altering, but it helps when I’m thinking about my training. Have you had any mentors, and if so what did they teach you? I’ve had a few different mentors. Mainly I learned the value of hard work and not giving up. When I was in university, in the summers I would work building mountain bike trails, and I would ride my bike about two hours each way, every day, then build trails all day, then ride home. I had a mentor at the time who was encouraging me to do that. It was just exhausting work every day — eight hours of physical labor, four hours of bike riding, and then just passing out. She helped me to see that you’re able to do whatever you want. There’s no limit to what you can accomplish when you put the work in. Is there anything that your parents did for you that many parents don’t do that had a lasting impact? Support; don’t pressure. That’s the advice that I could give other parents, even though I’m not a parent. I know a lot of people who have incredible athletic potential, and their parents pushed them to train more, pushed them into sports too forcibly, and that just turns the kid off. That could be with any activity. What my parents did really well was they supported everything I wanted to do, but at the same time, they never hovered over me and gave me tons of pressure to succeed and do this and that. How do you sleep, and how do you get your best sleep? I sleep pretty well, basically like a log [laughs]. I usually go to bed around 10:00 and wake up around 7:30 or 8:00. Lots of sleep! I’m so active during the day, I just kind of pass out at night. When I was in university, I used to like stay up late, not necessarily partying but studying to the last minute. As I’ve gotten older and wiser [laughs], I realized: get stuff done when you have the time to do it. Don’t leave it until the last minute. This helps with everything in life. Get things done, don’t procrastinate, and then you end up sleeping better. Do you keep a journal or diary, either for training purposes or for pleasure? That’s something I’ve played with on and off. In the past I’ve kept a very detailed training log/diary. Then I’ve kept a medium-detailed one [laughs]. Right now, I don’t keep any kind of logs, other than what my GPS sports watch records. I know a lot of people keep them because they like going back and looking at what they’ve done and what’s worked for them. I haven’t found it really works for me or has been worth the effort. What are some changes to your diet that you’ve made that help in your day-to-day? Something that I’ve been playing with on and off is my iron intake. I do so much endurance training, I end up breaking down my hemoglobin very often, so that’s something I have to stay on top of. I make sure I eat red meat a couple times a week, and sometimes I take iron pills, and then combine that with lots of vitamin C to try to make sure I have those stocks nice and high. Who is the best person in the world right now at what you do? I don’t think there is a single name that comes to mind, because the sport is so variable and so wide. There are people who excel at extremely short, powerful events, and there are people who excel at longer, slower events, and then there’s everything in between. You mix in different terrain types, different elevation profiles, different obstacles, it makes it so difficult to excel in every discipline. So I don’t think there’s one athlete that stands out. There’s a guy from the UK named Jon Albon; he won the OCR [Obstacle Course Racing] World Champs and the Spartan World Champs this year. If I had to pick one person, I’d say him. He’s a very gifted athlete. What’s a controversy or debate that’s going on within endurance sports that people outside of it probably wouldn’t know about? Within the sports that I do like obstacle course racing, there are big arguments right now about the different companies and the direction the sport’s going to go. You’ve got Spartan Race, which is one of the bigger races, pushing to be basically the only race that exists. Then you have a bunch of other companies that want their races to be legitimate. The problem is there are no real sanctioning bodies within the sport, and you’ve got everybody arguing about which is the “real” event, which is the “real” sport. To me, they’re all lots of fun, and they’re all great, and they all have their own merits. But you do have all this quibbling going on. Snowbeard? Check. Shredding at max speed on the skis is always fun. 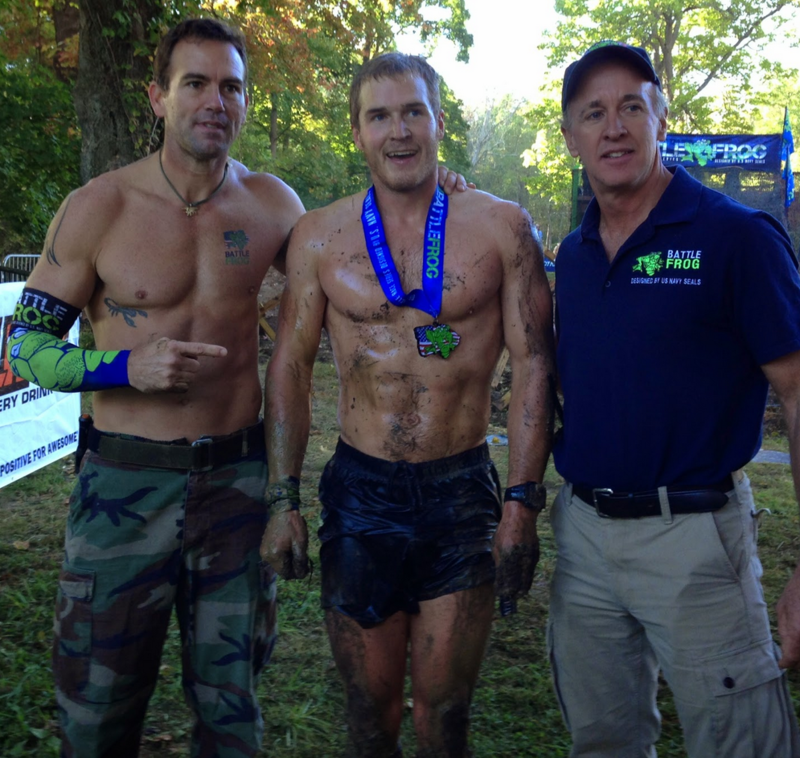 @battlefrogseries #TeamBattleFrog getting ready for 2015!! You’re engaged now. How did you propose? We had just bought our first house together, and it was our first night in our new house. I made her dinner, got the wine out, and then just as we were about to start eating, I got down on my knee and asked her to marry me. She said yes. Pretty cool. What’s a memorable gift you’ve received? The best gift you can give someone is an introduction to a new experience or a new skill. There was someone who introduced me to cross-country skiing when I was about 18. They taught me how to ski, helped me find equipment, did all sorts of stuff. It’s now a sport that I really love — I was just doing today [laughs]. The coolest gift you could ever give someone is to introduce them to a passion that they’re going to hold dear to them for a long time, maybe the rest of their lives. What advice would you give younger people working on their education or a new career? You should find someone who you respect, someone older who seems happy to you, and talk to them about what they do and how their career path unfolded. Do that with as many people as possible. Don’t shy away from hard work. Some people will say, “I don’t know what to do at university so I’m just going to take the easiest program and float my way through it.” That’s a terrible idea. If you don’t know what you should do, you should err towards harder challenges. I see a lot of friends who go through a program for three or four years — they probably went because someone suggested it or their parents wanted them to — then they come out of college and they really dislike the job that they trained for. Instead, just spend a couple days here and there shadowing someone who’s doing the career that you’re considering and see what it’s like, see if it’s something you could see yourself doing. Do that when you’re 16, 17, 18, versus after you’ve spent thousands and thousands of dollars on schooling.